The old shoe factory in Vinningen became too small. Also, it was not up to the changed standards. 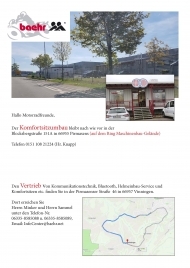 Therefore, we decided to buy and by the end of 2001 we moved into our very own premises in Pirmasens. We found a suitable building in „Husterhöhe“, an area which had formerly been used by the military. On a total area of 5300 m² we have more than 1500m² for production and administration and 500m² for storage at our disposal. With easy access to main roads. We still have an approximately 500m² spare area designated for future expansion. Still, the main part of production is handcraft. The skills and knowledge of our production team cannot be replaced by a robot.